I read a story once about an oni who came to an old woman's house and said he was going to eat her up. 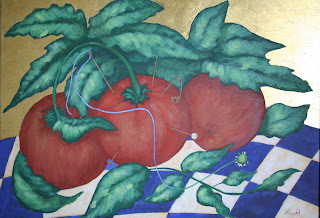 She told him that she would be much too tough and stringy, and wouldn't he rather have a nice tomato instead? She offered him a basket of tomatoes, still warm from the sun. In it, she had hidden her pin cushion, which looked exactly like the tomates from her garden but was full of pins and needles. The oni took one bite and went howling away down the lane. I've often thought about how the old woman prevailed over that bully by using her wits instead of violence. I'm posting this today for IF's topic, Giant, because the old woman beat a giant problem, literally and figuratively. Also, in this beginning summer season, I have Giant tomatoes on my mind. This is an egg tempera painting on panel, with gold leaf. I love this story, and the painting! Wicked Oni! What was the name of the story? Did you ever read "the silly little woman?" I don't know what the name of the story is, Kerry, but I wish I did. The Silly Little Woman sounds like a story from the same book, I think, about a little woman who stole the clothes from a scarecrow, and the scarecrow haunts her until she gives them back. Is that the one you are thinking of? Thanks for stopping by! Oops, I miswrote the title of the story I mentioned: it's The Funny Little Woman, it's about a woman who loses her dumpling, follows it into the underworld and must escape the oni she encounters there. But the inspiration from the story, I think, is from a book, Japanese Fairy Tales and Others, by Lafcadio Hearn. In that book, the story is called "The old woman who lost her dumplings." Thanks, Kerry, for the references. I took a quick glance at my Japanese story books and I didn't find this one, but I will order the book you mentioned. I love how oni can be outsmarted so easily, and many times by older women! I have to confess that I borrowed the term oni and applied it to a western fairy tale; probably in the story I read it was a troll or an ogre. Also, I got the title of the little woman story wrong, too. I think it may have been The Teeny Tiny Woman. Thanks for bringing my attention back to these stories!